15-year-old Filipino high school student Angelo Casimiro continues to garner numerous attention online as he make wave for his latest invention, the electricity-generating shoes powered by an in-sole generator. The in-sole generator invented by Pinoy teen inventor has the capacity to charge personal devices including smartphones and other gadgets. The invention is also equipped with Global Positioning System (GPS) which can be tracked in any variations. “This can supply power for personal devices especially if you live in remote areas where electricity isn’t available. It can charge flashlight(s), phones, radios and any other USB device,” Angelo Casimiro said in the video. 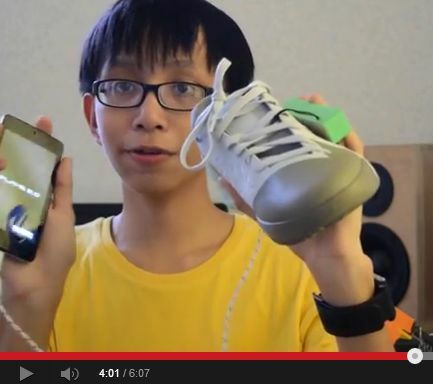 Angelo Casimiro presented his official entry to the Google Science Fair 2014 through his YouTube video where he unveiled his electricity-generating shoes. According to Angelo Casimiro, his invention is beneficial to shoe companies who might consider his invention for their future products. The in-sole generator can also run Arduino and Bluetooth transmitters. Based upon the report of GMA News Online, the electricity-generating shoes can charge a 400mAh lithium ion battery by jogging at approximately eight hours. The invention is built with piezoelectric component which can generate at least 26 volts. “I’ve been making projects since I was four years old, and now I that I have earned a lot of knowledge through my experience, I now compete in the annual National Robotics Competition,” cited Angelo Casimiro on his website. Angelo Casimiro will soon compete in Beijing for the upcoming International Robotics Olympiad on December 2014.
where can I contact mr. angelo casimiro? please email me as soon as possible…thank you.